A little more than a year after the bombings that killed three and injured more than 260 others, we spoke with spectators and asked them to reflect on their feelings. Here are some of their stories. “We want to make sure it will never happen again”- Marcus Klevin, 13. 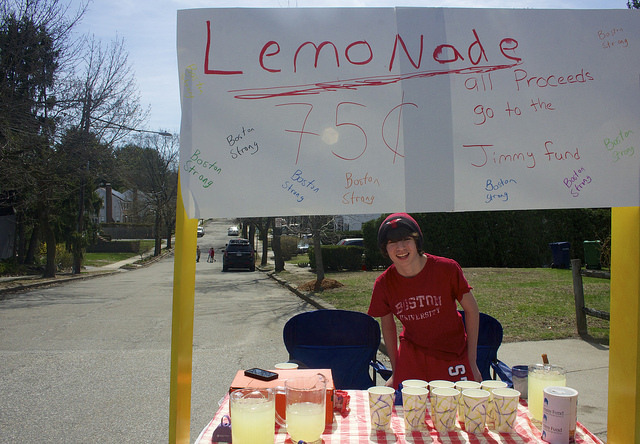 Marcus Klevin was selling lemonade with his youngest brother Andrew along Longfellow Road in Newtown, Mass., just as he did last year. They were raising money for the Jimmy Fund Clinic, a center for pediatric research cancer. He remembered his fear when the homemade bombs exploded last year,. but this year was different, resilience has replaced anxiety. 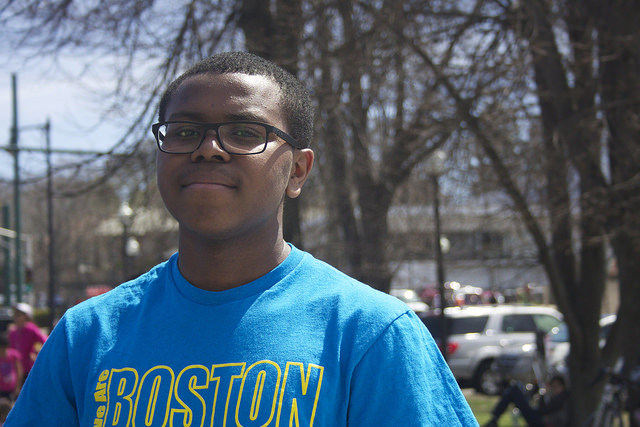 “I am not so scared because I know that Boston is a very strong place and we all come here together and deal with it like we always do,” said Klevin. “We were devastated”, Christine Desteiger, 62. Chris of Rochester Hills, MI came to support her son David who was running the 26.2 miles. Desteiger’s son already had four marathons under his belt. Today, like everyone in the crowd, Desteiger said that the 2014 Boston Marathon was anything but unsafe. “It is the safest place to be running in a marathon”, Desteiger said. Security was tight with more than 3,500 police officers monitoring the area. “I was so upset because we have friends that were running in the Boston marathon last year, so they are constantly in our prayers,” said Desteiger. 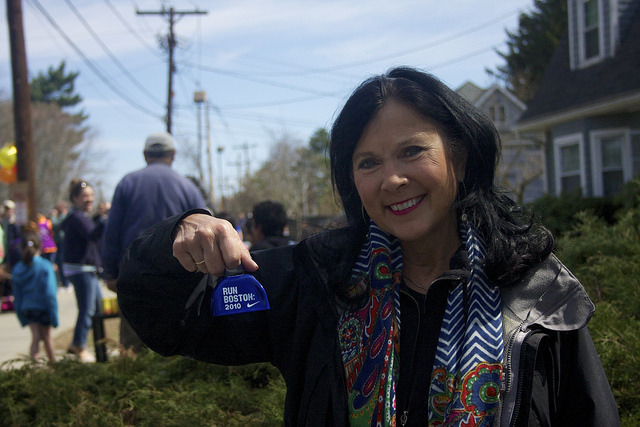 “Boston needs support and I am giving the support they deserve”, Audrey Minzner, 71. 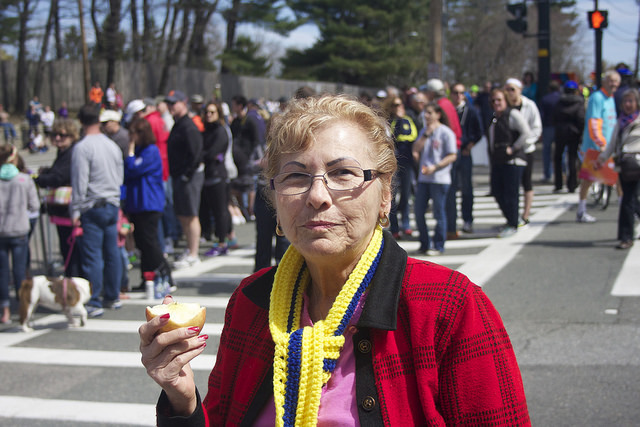 Audrey Minzner came from Pittstown, NJ to support her son, Dan, who was running in his third Boston Marathon. He finished the race last year, long before the first bomb exploded. She wore a blue and gold hand-knitted scarf with the official colors of the race. The scarves were distributed by United Church of Christ to honor the runners who come from all 50 states and 11 countries. The Boston Marathon is also a college tradition. College students from the 58 institutions of higher education in greater Boston including Boston College, Boston University, Harvard, Emerson, Northeastern and Tufts came out of their dorm rooms to celebrate the race. 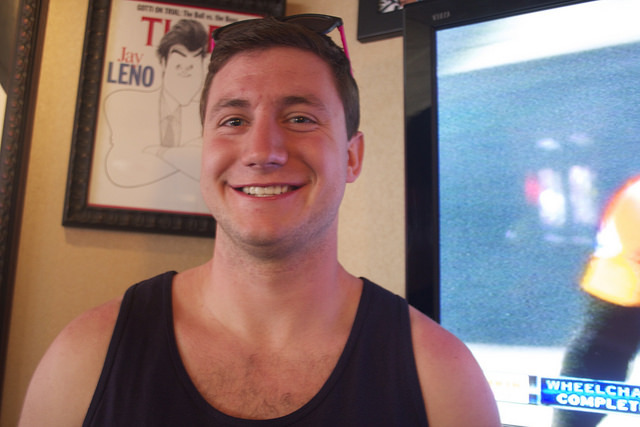 Drew Soma of Chestnut Hill is a student at Boston College. He came with his classmate Marissa Venuto to cheer near mile 21 on Heartbreak Hill. “Everyones support is a huge testament to how Boston bounces back from a tragedy and it shows a lot, “said Soma. “I love Boston and I love the people. I feel they are really courageous, ” Susan Beyer, 47. 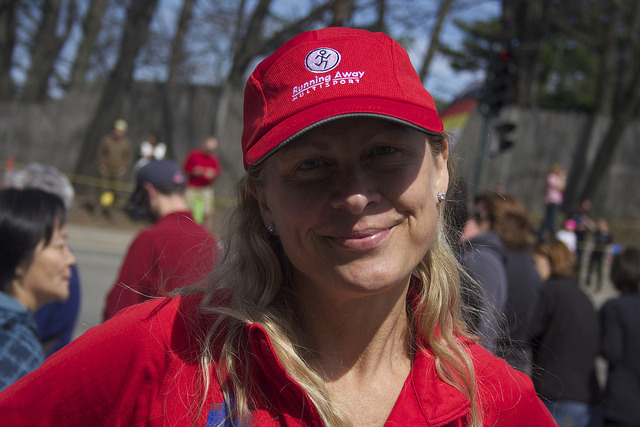 Susan Beyer from Deerfield, Ill., had an injury last year and was unable to run the marathon. A flight attendant for American Airlines, she is haunted by the specter of terrorism and is constantly vigilant, but said she will never give in to fear. 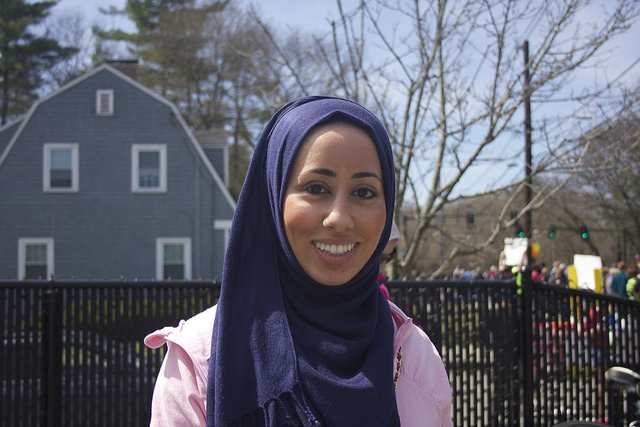 “Boston strong is the spirit of our city”, Suzan El-Rayess, 28. Armed with her bell, Suzan El-Rayess from Roxbury, Mass., wanted to be part of the world’s oldest and most prestigious road race. This year’s race has the second-largest participation in the event’s 118-year history. El-Rayess was among the thousands of people encouraging the runners and helping them to get to the finish line. “This is the most historic peaceful athletic event in the world, so we are going to make sure this spirit of the day is still happening,” said El-Rayess. 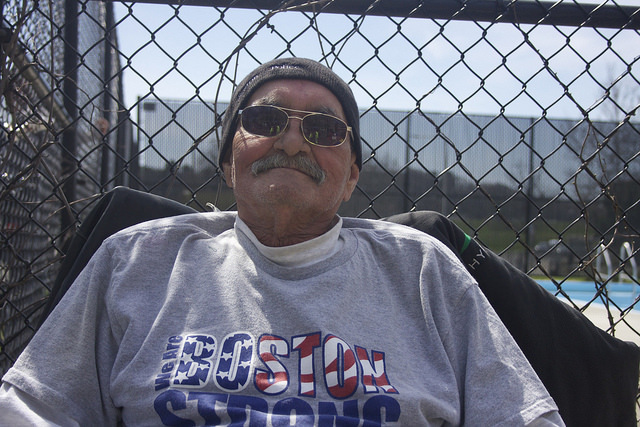 Rudy Hernandez has lived in Boston for 52 years and never misses the marathon. “I want to be strong for the city and show to the negative people that there is patriotism”, said Hernandez wearing a grey Boston strong sweat -shirt. In the days and months that followed, the motto became a message of solidarity for people all over the country. But this year Hernandez does not feel that strong. “It happened”, said Hernandez, “And there is nothing we can do about it, except to try to be together and help each other out”. Hernandez was not here when the Bombings happened. But April 15, 2013 stayed with him. “I would like to find this kid (Dzhokhar Tsarnaev, the alleged bomber), I know I can kill him,” he said. “I am a human being and human beings were hurt, so it touched me “, said Mark Dolan of New Hampshire, who lost his sister from cancer last month. His niece, is running in her memory. The family has raised more than $17,000 for the Dana-Farber Cancer Institute. For the people who live in the Boston area, last year’s bombings are vivid memories that have changed a whole community. 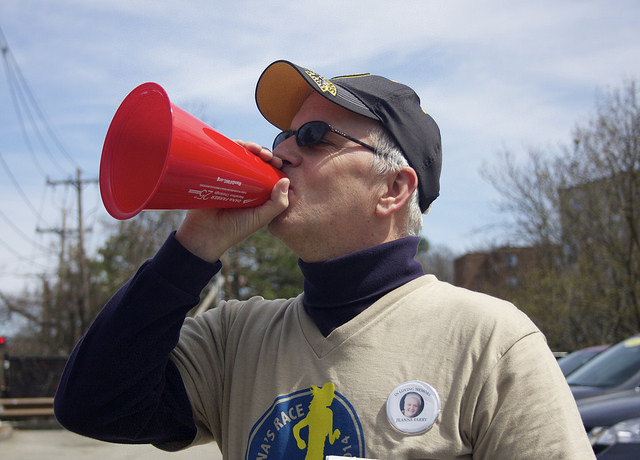 Ty’Aaron Emmis wore a blue Boston strong tee shirt, supporting runners in front of Reservoir Station. But for the teen, Boston strong is more than a memorial slogan. After the terrible event, citizen got closer and kindness emerged from tragedy, he said..
“We‘re a very strong city, we all came together as one,” said Emmis.